Follow these 5 grip strength training tips for ferocious forearms. The grip is often a weak link for the typical trainee and key missing element in muscle building workouts today. Yet not so long ago, the strongmen of yesteryear were hero-worshipped for their formidable forearms and fantastic feats of gripping prowess. So why is grip strength training so important and what will a gorilla grip do for you? 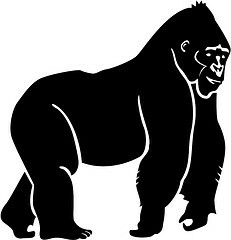 To discover the best way to build strongman forearms forged from steel, see the following gorilla grip training tips. Hand grip exercises are the foundation of grip power and strength - the same foundation that leads to sleeve-bursting arms. Yet what if you want to train your grip, but haven't the time? Is there a cheat's method to forge a King Kong clutch? There is, and it is called thick-handled bar training. The cheat's method requires you to substitute thick-handled bars for your regular bars during training - this is easily achieved by using towels or rubberized foam to increase your bar diameter. Your reward? Ferocious forearms. Another way to train gripping strength is with a hex bar or trap bar. The remarkable hex bar was the brainchild of Al Gerard, a North Carolina powerlifter who suffered from a painful lower back. This bar would see Gerard witness strength gains in his deadlift and squat, and grip too. Want to work your crushing and pinching grip? Not only does sandbag training exercise your physique from head to toe, but it also works your fingers. The secret? Search for a convenient place to grab, and your bonus will be dynamite digits. Rather than counting repetitions when grip training, why not count seconds instead? Trainer Charles Poliquin champions this method, using a predetermined time for his grip workouts. For example, squeeze your thick-handled bar as you count to 60 seconds. This time under tension will fire a furnace in your forearms. To build scorching strength and size let us finally look to the Far East. Bruce Lee's desire to maximize his physical potential would see the "Little Dragon" place special emphasis on his grip. This included one-armed chin ups for 50 reps, wrist curls, and commission custom-built gym equipment to train his tremendous talons. Grip strength is a key missing element in muscle building workouts today. Your 5 gorilla grip training tips promise ferocious forearms.